Hold onto your seats ladies and gentlemen…This is a first. That’s right. This is the first flavor ever created by The Husband. Now, let’s not get confused. The Husband took no part in actually making this gelato. Well, that’s a small lie. He went out and bought the lemon, but that’s it. Oh, and he ate the gelato too, but that doesn’t count. This is also a first for me because given my past track record with egg-based ice creams, I’m proud to report that this one went off without a hitch. Heck, I may go so far as to say that “technically” this is one of my best creations yet! I love basil, give it to me on fresh pasta and pizza, and I’m sold. But, please don’t give it to me before noon, thankyouverymuch. Apparently The Husband holds by a different standard because he just can’t get enough of it! We recently purchased a little basil plant to feed his habit. Everything was going smoothly until one night I went to make pizza and noticed that the plant was totally depleted. Naturally I confronted The Husband who remarked sheepishly, “what, I wasn’t supposed to eat the whole thing?”. Ug. No. Fast forward a few weeks and we’ve replenished our basil collection. I was putting the finishing touches on the New York Cheesecake Ice Cream Pie when boom. It hit him. 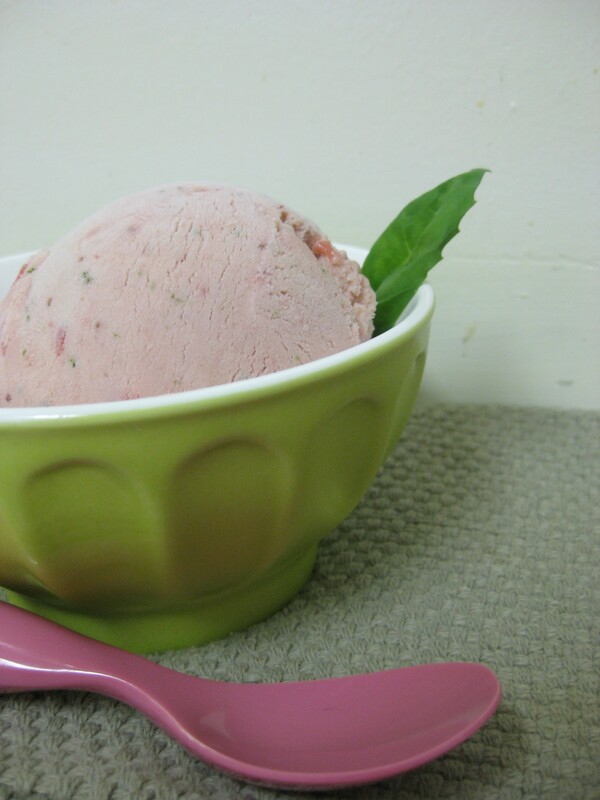 Strawberry Basil Gelato. I personally love gelato, but find it’s slightly harder to make it at home because gelato, unlike ice cream, has a lower fat content due to the primary use of whole milk. As a result home-made gelato doesn’t always keep as well in a home freezer. Additionally, it’s often made with eggs, and I personally get rather temperamental when tempering eggs. 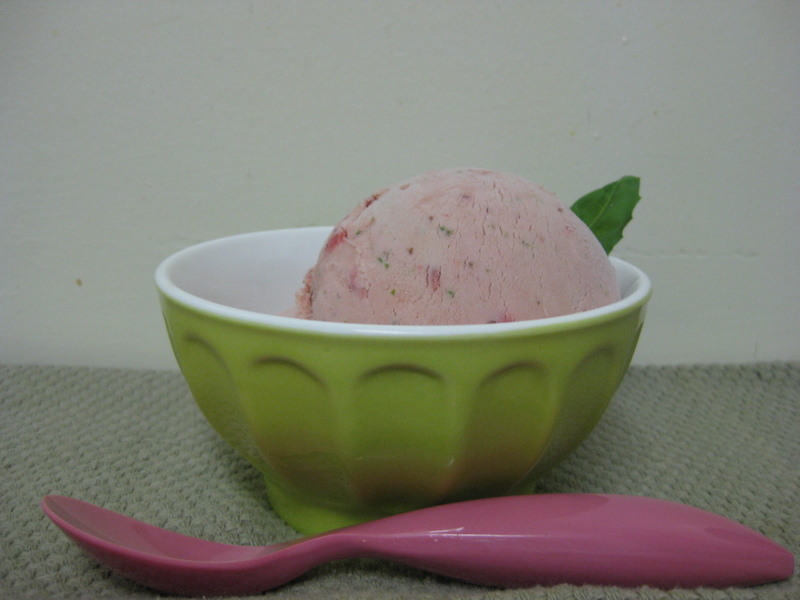 But, I gave it the old college try because strawberry basil gelato seemed like a good idea. Day 1 – To make the custard base pour the milk and half-and-half into a medium pot. 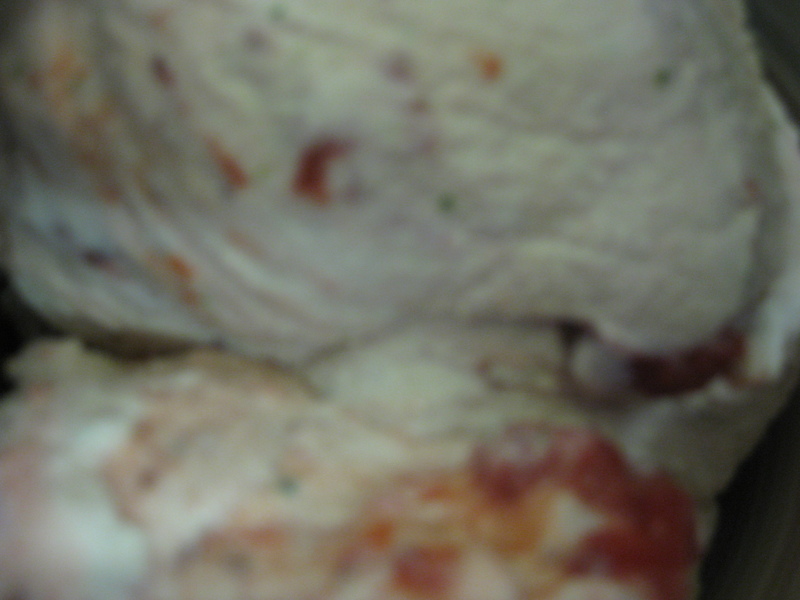 Heat slowly, and stir occasionally so that a skin does not form on the milk. Heat until small bubbles form on the sides, but do not boil. In the meantime, whisk the four egg yolks together in a large heat-proof bowl until smooth. 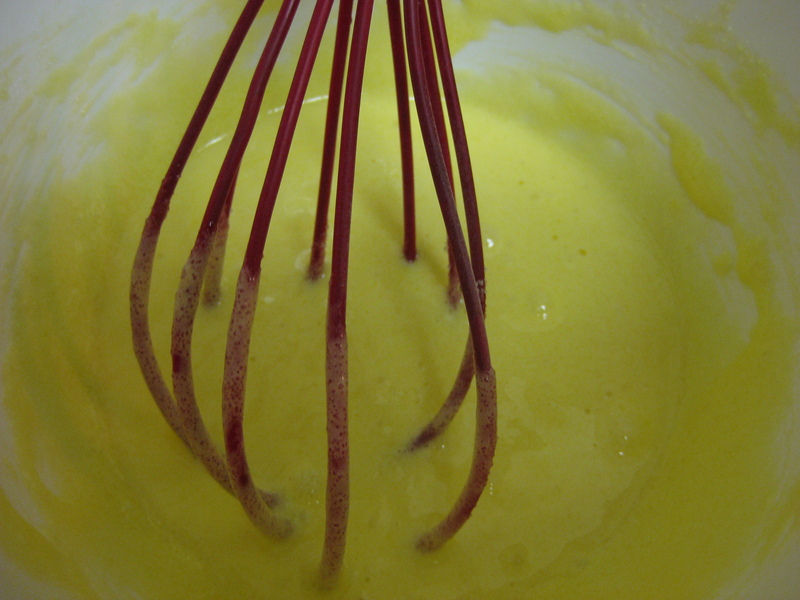 Gradually add in the 1/2 cup of sugar until the yolk mixture is very thick and a pale yellow color. Here’s where you’ll begin tempering the eggs. Slowly add the hot milk mixture into the egg mixture and whisk continuously. Once you’ve combined the eggs and the milk, pour back into the medium pot and slowly heat the mixture until it reaches 185 degrees F. Trust me here, you’ll want to use a thermometer. If you overcook the egg mixture, it will scramble, your whole kitchen (or apartment if you live in NYC) will smell like eggs, and the mixture will be ruined. The eggs have been tempered! Success! With the heat on low, it will take at least 15 minutes to bring your mixture to 185 degrees. 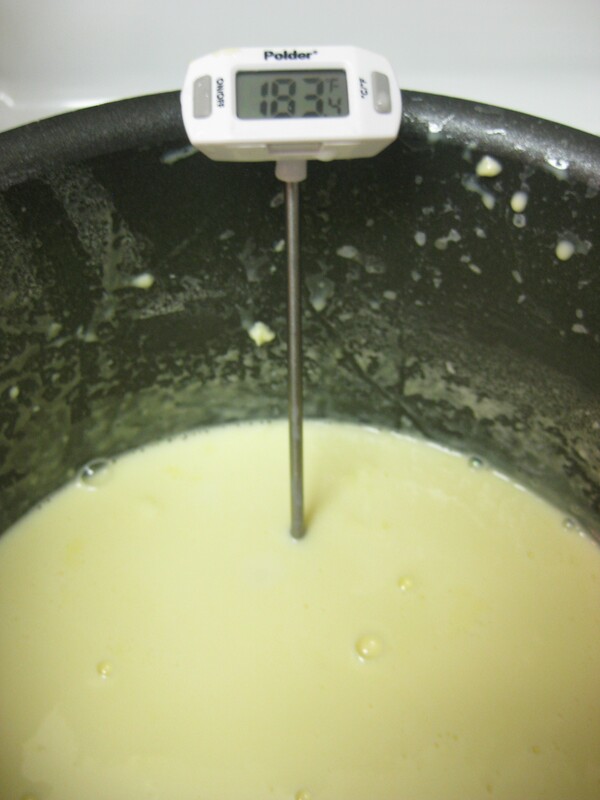 Stir occasionally until the mixture reaches the desired temperature and thickness. Once ready, pour over a fine mesh strainer so that you catch all the little mini pieces of “scrambled egg” that may have formed. Let the mixture cool entirely before refrigerating overnight. To make the strawberry mixture hull and thinly slice 1lb of strawberries. 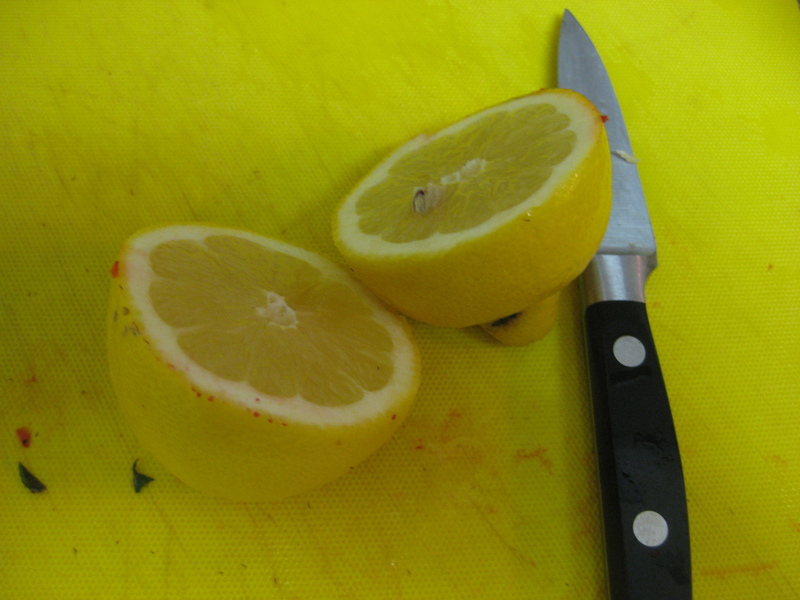 Put them into a small pot on the stove, cover with 1/4 cup of sugar and 2 tbs of freshly squeezed lemon juice. Let them sit (with the heat off) and marinade for 15 minutes. Then turn the heat on low and let the mixture cook until the strawberries are mushy and a syrup begins to form, approximately 10 minutes. Let the mixture cool entirely before refrigerating overnight. Day 2 – To actually make the gelato pour 3/4 of the strawberry mixture in the blender with the gelato base and 5 basil leaves. Puree until smooth. Taste the mixture and adjust the basil flavor to your liking. I added 7 leaves and found that was the perfect “earthy” flavor, but yet the basil flavor was not overpowering. Pour the mixture into the base of an ice cream maker and churn according to the manufacturer’s instructions. Approximately 5 minutes before the mixture is ready (for me this was after 13-15 minutes) add in the remaining 1/4 of the strawberry mixture. Scoop the gelato into a freezer safe container, garnish with a basil leaf and store in the freezer for 2 hours before serving. 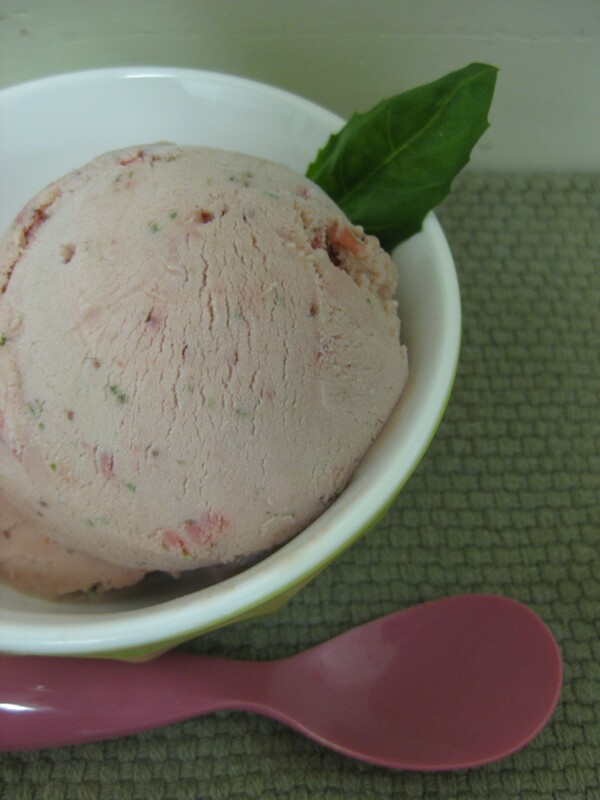 Most creative flavor...Strawberry Basil Gelato! The Verdict: I was so surprised and pleased by these flavor notes. First, I succeeded in tempering the eggs, and therefore the texture was so creamy and smooth. Second, the basil to strawberry ratio was spot on. When you take a bite of this gelato, the first flavor you’ll taste is basil. 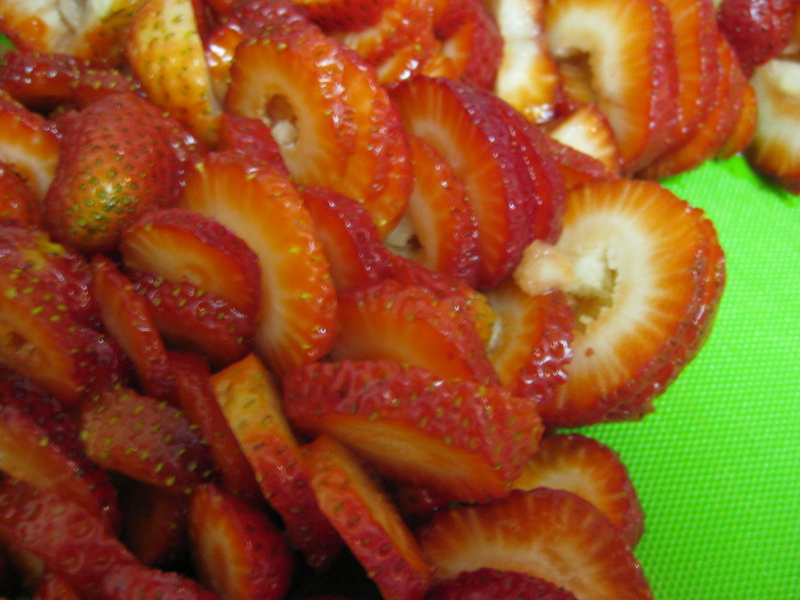 Then the strawberries hit you and together it’s a perfectly earthy combination. It’s hard to describe, so just trust me on this one. And the award for most creative idea goes to…drum roll please…The Husband! Look who made a beautiful gelato without a hiccup!! I hope it was as delicious as it looks! Mazel tov Mrs. Sugar, you are quite the chef ice cream and otherwise! Thank you so much for this recipe!! I went to a geletaria and they had this wonderful flavor and I’ve been on the hunt since then. I never knew basil and strawberry would go so great together! I’ve been spreading the word. Maybe a possible day of recognition is in order?